Gloves are available to protect hands and forearms from cuts, abrasions, burns, cold, puncture wounds, vibration, skin contact with hazardous chemicals and some electrical shocks. The nature of the hazard, the associated risk and the type of operation involved will affect the selection of gloves and it is essential that gloves are chosen that are designed for the specific application. Gloves designed to protect against one hazard may not protect against a different one even though the gloves may appear similar. To support this wide range of applications, CEN (the European Standards body) has developed a corresponding series of standards. Use of these standards assists glove manufacturers and suppliers in obtaining the CE Mark indicating the gloves’ compliance with EU legislation. Two general standards, EN 420:2003 and EN 388:2003, are called up in many of the other standards. This protective gloves standard is designed to ensure that the gloves themselves do not cause harm to the wearer and are comfortable to wear. Tests and requirements include the pH and chrome VI content of leather, determination of extractable protein content of latex, plus water vapour transmission and absorption of materials. In addition, procedures to examine the sizing of the glove and its effect on finger dexterity are covered, plus general requirements for the information to be supplied with and marked on the glove. Resistance to water penetration (EN 420, 4.2) is an optional test property that is assessed if it is required, according to the intended use of the gloves. For leather gloves a sample of the leather is subjected to penetrometer test, where it is clamped to circular clamps and flexed in a trough of water. The leather is flexed until water penetrates from the outer side of the leather to the inner side and is recorded as the number of minutes to penetration. Four levels of performance are defined within EN 420, ranging from Level 1, which is equivalent to penetration occurring between 30 and 60 minutes; to Level 4, where penetration does not occur before 180 minutes. An alternative more applicable test is used to assess textile materials. This method uses hydrostatic head equipment that applies a column of water at steadily increasing pressure to the outer surface of the gloving material, until penetration of water through to the inner surface occurs. The results for this test are recorded as the pressure required to cause penetration and is recorded in Pascals. EN 420 does not contain a requirement for this test, but requires that the level of resistance is communicated to the customer. There is unfortunately no correlation between the results obtained through these different test methods. EN 420, 4.3.2 determines the pH value. The pH value of a material is an indication of how acidic or alkaline it is, measured using the pH scale from one to 14. A measurement of one is strongly acidic and 14 is strongly alkaline. The scale is logarithmic, which means that each whole scale point is equivalent to a ten-fold change in acidity or alkalinity. Skin irritations can occur if a material in a PPE product has a very high or very low pH value, and particularly if the acids or alkalis present are ‘strong’ – that is, if they are highly ionised. For gloves of materials other than leather the material must have a pH value of between 3.5 and 9.5, thus excluding extremes of acidity and alkalinity. For gloves made from a number of layers then layers must be assessed. EN 420, 4.3.3 is applicable to leather gloves only, to determine the chromium VI content. Chromium is a transition metal, the salts of which are used in leather tanning. In leather it can exist in two forms, or ‘valency states’, known as chromium III (trivalent chromium) and chromium VI (hexavalent chromium). In the finished leather it is usually present as chromium III. It is possible, however, that during the tanning process or under certain storage conditions, small amounts of chromium III can be oxidised to chromium VI – a known skin irritant, potential carcinogen and environmental hazard. Chemical innocuousness testing of leathers requires that there is no detectable chromium VI present. The upper limit of detectable chromium VI is quoted as 3ppm (parts per million). If a level below this is detected, no detectable chromium VI is present as defined by the detection limit. products (EN 420, 4.3.4) is essential to avoid this. One common product where latex is used is in medical examination gloves for single use. The nature of this product causes the wearer and the patient to have direct skin contact with the latex. This means that the issue of allergies must be considered as part of the chemical innocuousness testing. The test data is required to be marked on the product or the packaging, in order to allow the end user to make an informed choice of suitable product. A glove should allow as much dexterity as possible given its purpose, and this is determined in EN 420, 5.3. This property is assessed by a panel of users who try to pick up cylindrical pins of varying diameters, from 5 to 11mm, while wearing the gloves. EN 420 contains five levels of performance, ranging from Level 1, where the wearer is only able to pick up a pin with a diameter of 11mm, to Level 5 where the wearer is able to pick up the smallest pin of 5mm diameter. EN 420, 5.3 (water vapour transmission and absorption) states that where practicable, protective gloves must allow water vapour transmission to aid comfort by allowing perspiration to escape the glove, therefore aiding wearer comfort. Obviously moulded rubber or polymeric gloves will not allow water transmission and hence this property is not relevant. For other types of gloves the water vapour transmission is assessed by clamping a sample of material in the mouth of a bottle containing a solid desiccant and is kept in a rapid current of air in a conditioned room. The air within the bottle is circulated by keeping the desiccant in motion. Weight gain of the bottle is caused by the desiccant absorbing moisture from the air that has transmitted through the material. The results are expressed in units mg/(cm 2 .h) and EN 420 requires that the materials possess a water vapour transmission of at least 5 mg/(cm 2 .h). For materials where the glove construction and material inhibits water vapour transmission then the glove must reduce the effects of perspiration by being absorbent. This property is assessed by clamping a sample of material over the mouth of a sealed container over a reservoir of water. During the test water vapour is absorbed from the air within the container and is expressed in mg/cm 2 . EN 420 requires that the glove has a water vapour absorption of at least 8 mg/cm 2 when tested for eight hours. The EN 388:2003 standard is intended to assess a glove’s ability to protect against mechanical hazards such as cutting. It includes a series of four tests that measure the glove’s resistance to abrasion, cutting, tearing and puncture. The abrasion resistance test (EN 388, 6.1) is undertaken on a Martindale wear and abrasion machine, in which specimens of the material (cut from the palm of the glove) are fitted to a rubbing head of fixed size and weight. This head is then moved in an elliptical motion over a table covered with 100 grit abrasive material. Four specimens of the material are tested, with the test result being the number of cycles required to abrade through (hole) the material. The performance level of a single material is decided by the lowest result of the four tests. For multiple layer materials (where the test specimen is made of several unbonded layers), each layer is tested separately. The performance level is based on the sum of the number of cycles. Four levels of performance are defined within EN 388, ranging from Level 1, (which is equivalent to holing between 100 and 500 cycles) to Level 4, where holing does not occur before 8,000 cycles. The EN 388, 6.2 – Blade cut resistance test consists of a circular, free rotating blade, under a standard 5N contact force, which tracks backwards and forwards over the flat surface of the test material within a fixed stroke length. The test stops when cut through of the blade is detected (via electrical contact with the underlying surface) and the number of strokes completed by the blade is recorded. To take the sharpness of the blade into account, the test is performed using a standard canvas control material both before and after testing the specimen. The mean of these two tests on the control material is then calculated. The test result is determined from the number of cycles required to cut through the specimen and the mean number of cycles required to cut through the control fabric. Where multiple layer materials are present, the layers are assembled and tested as they would be in the glove. Two test specimens are selected and each specimen is tested five times, allowing for any variation across the specimen. A mean blade cut index is calculated from the five tests. The performance level is based on the lower mean blade cut index of the two specimens, ranging from a Level 1 cut resistance of greater than 1.2, up to a Level 5, with a result greater than 20. For all higher level cut resistant materials (Levels 4 and 5), it is permissible to use ISO 13997:1999 – ‘Protective clothing – Mechanical properties – Determination of resistance to cutting by sharp objects’ cut test as an alternative. This alternative test uses a straight blade drawn across a specimen until cut-through takes place. The test measures the load applied to the blade in order to make a cut-through over a 20mm stroke length. Because the4 blade travels a much shorter distance, the blunting of the blade plays a much less significant role in the test results. Through plotting of the results from an initial set of tests onto a scatter graph, force against stroke length can be plotted using a trend line that estimates the force necessary to create a 20mm stroke length. Once determined, the identified force is applied to the specimen a further five times. In the EN 388, 6.3 – Tear resistance test, specimens of material from the palm of four gloves (two from the longitudinal direction and two from the transverse direction) are prepared and clamped in the jaws of a standard tensile strength testing machine. The jaws are moved apart at a constant speed of 100 mm/min, and the force needed to tear the material is measured. For single materials, the performance level is given by the lowest result of the four tests. For multiple layer unbonded items, each layer is tested individually. Four tests are carried out on each layer, and performance is based on the lowest individual result of the most tear-resistant material. EN 388 defines the performance levels as ranging from Level 1, whereby the specimen can resist a peak force between 10N and 25N, to Level 4 where the tear strength is at least 75N. Test specimens for EN 388, 6.4 – Puncture resistance are again taken from the palm of the glove. In the case of unbonded multiple-layer materials, the layers are assembled and tested as they would be in the glove. The test uses a standard, rounded stylus which is pushed through the specimen at a fixed speed of 100mm/min using a compression test machine, and the maximum force required for the stylus to penetrate fully through the specimen is measured. Performance levels are based on the lowest of four test results – defined in EN 388 as being from Level 1, with a puncture force of between 20N and 60N to Level 4, which has a measured resistance of at least 150N. Part 1 details the performance criteria, includes requirements to check the mechanical and physical integrity of the products, and also specifies that the glove must meet the requirements of EN 388:2003. Penetration resistance in part 2 is determined by subjecting the gloves to either air leak or water leak tests to determine if any holes are present that would allow chemicals to penetrate through to the user’s hand. Part 3 specifies the determination of the resistance of protective glove materials to permeation by potentially hazardous non-gaseous chemicals under the conditions of continuous contact. Permeation is the process by which a chemical moves through a protective glove material on a molecular level. Gloves are classified according to the breakthrough time of the chemical through the glove material. For compliance with the standard as a glove protecting against chemicals, the glove must achieve a permeation result of at least performance Level 2 when tested against three or more of the chemicals from the list of 12. Additional permeation tests4 against other chemicals specific to a particular end use are also often carried out to demonstrate the suitability of the glove. Part 4 is the most recently published part of the standard and is applicable to gloves made of natural or synthetic polymer. The resistance of a protective glove material to degradation by a liquid chemical is determined by measuring the puncture resistance change of the glove material after continuous contact with the external surface with the challenge test chemical. This is a general standard designed to be used for any glove that is to be produced and sold as providing protection against thermal hazards. The standard includes six thermal tests – burning behaviour, contact heat, convective heat and radiant heat, as well as against small and large splashes of molten metal, plus reference to EN 388 and EN 420 for mechanical and general performance requirements. EN 12477:2001 is a standard specifically for gloves to be used when welding, and is based on the tests in EN 388, EN 407 and EN 420. Two types of glove are catered for: ‘Type A’ and ‘Type B’. Type B has higher requirements for dexterity to cover use in some specialised welding operations, whereas Type A gloves are intended for other more general welding processes. Gloves that are intended to be used for arc welding must be tested to EN 1149 for electrical resistance. This specialist standard is for gloves used in firefighting. It references test procedures from EN 420, EN 388 and EN 407, plus other specific tests for properties such as resistance to water and chemical penetration. This is a general standard designed to be used for any glove which claims protection against cold environments. 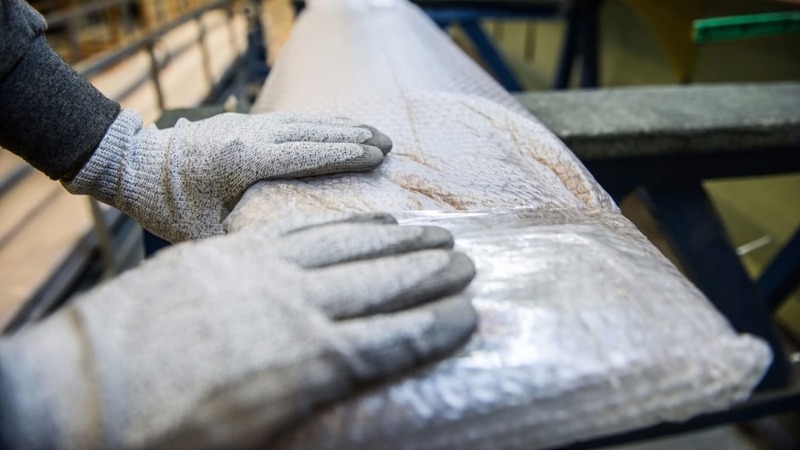 The standard includes three specific tests for assessing thermal insulation: convective cold, contact cold and water penetration, plus low temperature flexibility tests for coated materials, in addition to requirements from EN 388 and EN 420. In addition to reference to the general standards of EN 420, EN 388 and EN 374, it also includes special test procedures to measure the effectiveness of the glove at attenuating/absorbing radiation and its water vapour permeability. This standard defines a test to measure the cut resistance of the glove against a simulated chainsaw accident and also includes an assessment of the area of protective coverage. This is another specialised standard that includes a series of tests to measure a glove’s dimensions, design, protective coverage and impact cut resistance, in addition to the strength of chainmail. This standard is primarily based on a complex test procedure to assess a glove’s performance in attenuating transmitted vibrations. This is a standard developed for testing gloves intended to protect against high voltages. It includes six classes of protection (referenced 00, 0, 1,2,3,4), which cover working voltages from 0.5 to 36 kV ac. The standard includes performance requirements and test procedures to measure electrical and mechanical performance, both before and after a range of pre-treatments. Both EN 388 and EN 420 are undergoing revision at this time. It is expected that EN 388 will be published in 2016 and is expected to incorporate the ISO 13997 cut test into the standard and include an optional test for gloves that provide impact protection for the knuckles. Work has only just begun on EN 420 and this is not expected to be published until next year. As with many of the standards developed as a result of the EU Directive on PPE, the classification of a glove in a particular test is usually defined as one of a series of performance levels (usually between 1 and 4 or 5). It is then left to the user, following a suitable risk assessment exercise, to select a glove with a suitable profile of performance levels in relevant tests. Simon Courtney is a footwear technologist at SATRA Technology. He has a wide knowledge of testing and supports customers with technical reports, advice and in the preparation of company-own specifications.